In his new book If I Understood You, Would I Have This Look On My Face? Alan Alda describes a troubling interaction with an oral surgeon that took place minutes before a procedure was about to begin. The surgeon’s solution to his patient’s clear absence of understanding was to repeat the same word over and over, which is about as effective as shouting at person who speaks a language other than ours. And it turns out that the “tethering” that did occur had a lifetime impact on Alda for which he was psychologically unprepared and should have been given the opportunity to deal with before undergoing this surgery. If Alan Alda, a highly respected, international star, felt intimidated by a surgeon who was as cold and cutting in personality as the scalpel he was about to use, what chance does the average person have in a situation like this? 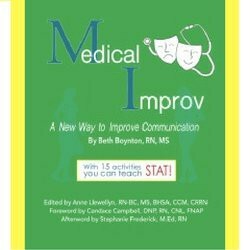 Beth Boynton, RN, MS dedicates her book — Medical Improv — A New Way Improve Communication — to the this important issue. She lays out the links between increased patient safety, reduced rates of burn-out and improved morale to medical professionals’ ability to connect, communicate and collaborate. And she champions improvisation as the most direct, effective approach to this kind social-emotional skill development. 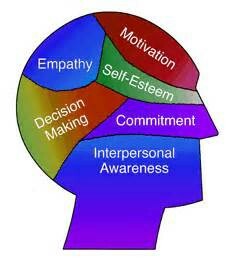 Developing Emotional Intelligence is known to reduce errors and increase mutual understanding on medical teams, because, as Boynton states, “human factors, leadership and communication are the top root causes” of adverse events in health care delivery. Improvisation is specifically designed to produce an atmosphere of psychological safety within which everyone involved can practice thinking and acting under pressure. When medical professionals are trained in social awareness and emotional intelligence, not only are patients less likely to wind up in Alda’s unfortunate position, their overall satisfaction with the medical experience rises, according to a study of the impact of Emotional Intelligence and communication skills training at Kaiser Permatente in California, one of the largest health care organizations in the country. Clinicians’ experience of their work was improved as well, as they “appreciate improving their communication skills as they deal with the complexity and constant changes they face in their practice.” Improved communication between physicians and patients also was found to reduce legal risks and better compliance to doctors’ recommendations. “Yes…and” — This first rule means that you accept and validate what your partner brings to the table and adds something of your own. It is the ‘Golden Rule’ of improv! You cannot play an improv activity without practicing your listening and speaking up skills. Help your partner be successful — it is your job to make your partner look good! You have everything you need — This rule is meant to help you trust yourself, your partner, and the process. There is no need to study or memorize, to be funny or perfect! Celebrate risk-taking — Anytime you are stuck or say something that doesn’t seem like a good fit, we’re going to celebrate your effort! Truth and facts are not necessary. In Medical Improv you can make things up. Avoid questions. Try to make statements as opposed to asking questions. Both of these books deal with the art of improvisation as a pathway to the heart of human interaction, which is of primary importance in the worlds of science and medicine. Through improv games and exercises, we learn how to connect to and communicate with another human being over whatever barriers may exist, to receive what others convey and shape interactions in powerful ways. This matters more than we may realize. “When patients can’t relate to their doctors and don’t follow their orders, when engineers can’t convince a town that the dam could break, when a parent can’t win the trust of a child enough to warn her off a lethal drug, they can all be headed for a serious ending,” states Alda. Boynton’s work in clinical settings shows that “improv activities provides lots of opportunities to learn what it feels like when you are supportive or being supported,” which translates into the ability to redirect anxiety about real world stresses and pressures with creative energy and skill. Jude Treder-Wolff, LCSW, CGP, MT is a consultant/trainer and writer/performer. Her company Lifestage, Inc is an approved provider of Continuing Education for social workers in NYS (provider #0270). She is host/creator of (mostly) TRUE THINGS, a game wrapped in a storytelling show that features true stories — with a twist — plus music.